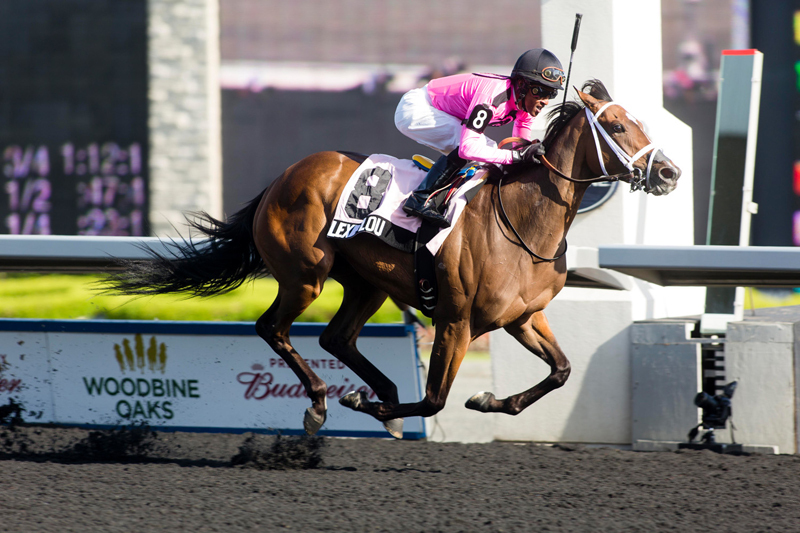 Bred by the late Dr. Michael Colterjohn’s Paradox Farms, Lexie Lou is being inducted into the 2019 Canadian Horse Racing Hall of Fame in the Female Horse category. French-bred filly All Along (FR), trained by Frenchman Patrick Louis Biancone and ridden for most of her career by Walter Swinburn, was the first winner of the Prix de l’Arc de Triomphe (G1) to race in Canada winning the 1983 Rothmans International (G1) as part of a 41 day international tour that also included wins in the Turf Classic (G1) at Aqueduct, NY and the Washington, D.C. International (G1) at Laurel, Maryland. Her 1984 campaign at age 5 included a fourth-place finish in the Rothmans International (G1) at Woodbine and a second-place finish behind upset winner Lashkari in the inaugural Breeders’ Cup Turf (G1) at Hollywood Park to conclude her race career. Named Horse of the Year on two continents, for owner famed art dealer Daniel Wildenstein and family, All Along (FR) was named Champion Older Horse in France and 1983 Horse of the Year in the U.S., the first female and foreign-based horse to win an Eclipse Award as Horse of the Year. At the time of her retirement following her 1984 campaign, All Along was the all-time leading distaffer in terms of career purse earnings with $3,015,764. Her broodmare career produced 11 starters and 4 winners from 13 foals; the first in 1986 by Mill Reef (GB), called Along All (GB) being the most successful, a G2 winner. All Along (FR) died at Three Chimneys Farm in Kentucky at age 26 in 2005. She was inducted to the National Museum of Racing and Hall of Fame in Saratoga in 1990. As a racehorse Angus Hall earned $830,654 in 26 lifetime starts and took a mark of 1:54.3. In 26 lifetime starts over two racing seasons, the regally-bred son of Garland Lobell – Amour Angus, bred by Québec’s Ferme Angus, won eight races and finished in the top three in all but four outings. He was the first two-year trotting colt to break the 1:55 barrier, winning in 1:54.4 at Colonial Downs. Angus Hall has sired over 1,700 horses during a stallion career spanning 18 years, with 71.5% of his foals having race careers. His offspring have earned over $102 million, and include six millionaires: 2008 CHRHF inductee Peaceful Way, Majestic Son, Elusive Desire, Winning Mister, Frenchfrysnvinegar and Laddie. His contribution to trotting bloodlines continues through top broodmares whose offspring have earned over $45 million. Additional information about the Canadian Horse Racing Hall of Fame may be found at www.canadianhorseracinghalloffame.com.